Perfect for smaller families, this Slow Cooker Turkey Breast With Gravy is easy to make and saves room in the oven for your other Thanksgiving dishes. This recipe has been updated from the original published in July 2013. Can you believe it’s November already? I’m totally not ready for the holidays, though I do love them! Over the years I have pretty much streamlined what I make for Thanksgiving and only change up a side dish or salad. That doesn’t mean I’m afraid to try new recipes on the holidays, I just know which one’s really work. The first time I shared this Slow Cooker Turkey Breast With Gravy it was summertime, hot, and I was just looking for something easy to make for dinner. Then I realized it would be great to make for Thanksgiving if I was only cooking for us and not my whole family, or for a very large family to have extra turkey. I do prefer my turkey with a crispy skin, so after it’s cooked in the slow cooker I put it in the oven at 450 for a little bit (you could also put in under the broiler), but this step isn’t needed if you prefer to not eat the skin. Which is much healthier, and why I don’t do it. Haha! Here is my Thanksgiving menu, and I will be sharing the recipe for the stuffing you see in the picture below next week. We always buy pies from my daughter’s school fundraiser for dessert. 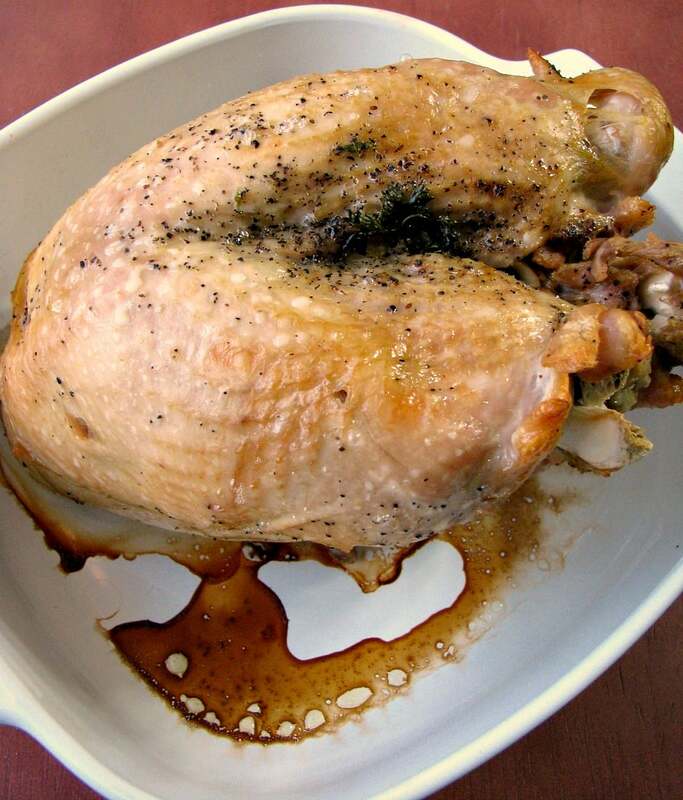 Thaw turkey breast for 2-3 days in refrigerator, if using frozen. Rinse the breast inside and out under cold water, and pat dry. Place in the slow cooker, sprinkle inside and out with salt and pepper. Place some of the carrot, celery, onion, garlic, and mixed herbs inside the turkey. Scatter remaining vegetables and herbs around the breast. 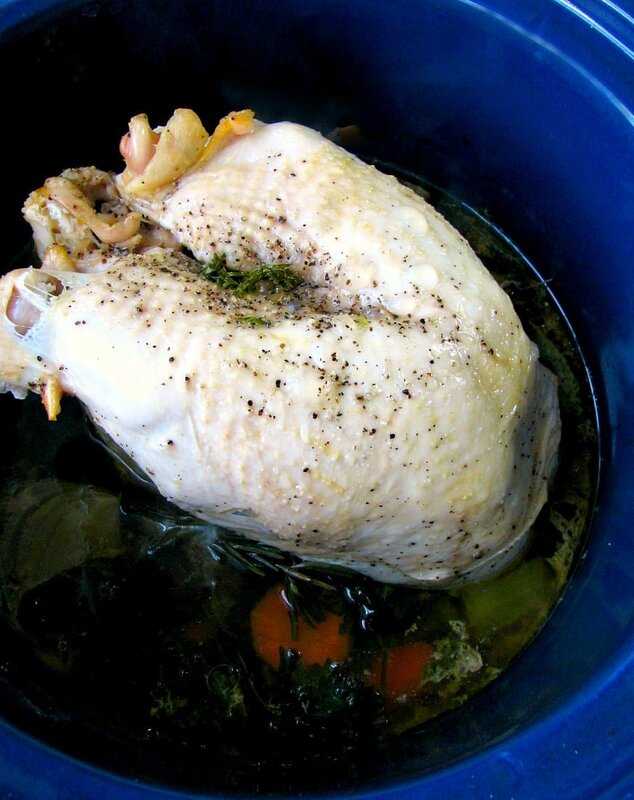 Pour 2 cups turkey stock in the slow cooker, then brush the turkey breast with olive oil well. Cover and cook on HIGH 4-6 hours, until turkey breast reaches 180*F.
Once the turkey reaches 180*F, you have two choices, you can remove it from the slow cooker ( do so carefully, it may fall apart), allow it to rest for 10-15 minutes, remove the skin, then slice and serve. If you prefer a crispy skin, remove the turkey from the slow cooker to a roasting pan and bake at 450 degrees for 10-15 minutes or broil for 6-8 minutes. While the turkey is resting, drain the broth left in the slow cooker to a gravy separator/strainer or large liquid measuring cup. Let it cool slightly so the fat rises to the top (place it in the freezer to cool quickly) Pour the broth carefully into a saucepan, allowing the fat and solids to remain in the strainer. Taste and adjust seasonings (salt, pepper, garlic powder, onion powder, etc). 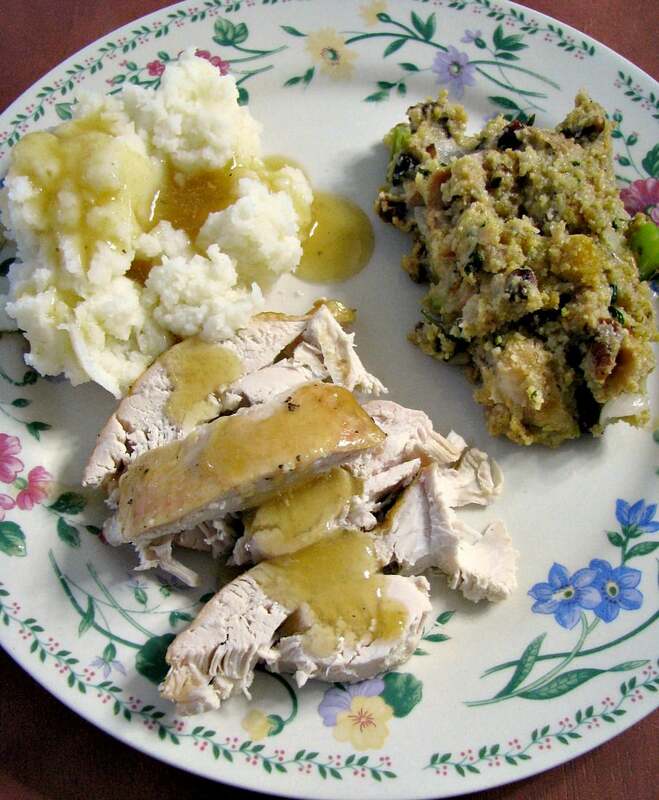 Mix 4 tablespoons cornstarch or flour with the remaining 1/4 cup turkey stock. Bring the broth to a boil, then pour in the cornstarch mixture, and stir constantly for 1 minute to prevent lumps. Serve the gravy on the side.